VOX stands for Voices Of eXperience – we represent your views to politicians and health professionals to make sure Scotland’s mental health laws and services reflect service user needs and aspirations. After all, we wouldn’t buy a pair of shoes without trying them on so why design a service or pass a law without consulting the people who’ll be most affected? We undertake this work to (i) improve the quality of life for people with mental health issues (ii) ensure public money is spent wisely, and (iii) benefit Scotland as a whole. Mental illness affects 1 in 4 Scots so everyone has a family member, friend, neighbour or workmate affected by mental illness – it affects us all, directly or indirectly. Does it cost anything to join VOX? Come on, there must be a catch? No, membership is completely free and anyone aged 16+ who lives in Scotland with a lived experience of mental illness can join. Your experience of mental illness can be past or present and we don’t ask for formal proof of diagnosis because that’s private and confidential – we trust you! Can carers or mental health professionals join VOX? No – VOX was set up to represent the views of people with mental illness because, in the past, their views were often ignored or overlooked. There are lots of organisations for carers and health professionals and we encourage people to join those groups which can then join VOX as Associate Members. If I join VOX, will I have to attend lots of meetings and committees? No, VOX makes very light demands on its members. We don’t have regular monthly meetings so – for most people – being involved in VOX will be limited to attending two national members meetings per year but only if they want to (it’s not compulsory!). We occasionally invite members to participate in research or surveys (to learn their views) but – again – this is totally optional. For most people, joining VOX just means they receive regular weekly email updates of events, occasional newsletters and invitations to attend events but people can pick and choose what they fancy. If they do want to get actively involved in mental health, they should join a local or regional group or think about joining the VOX Board. What does the VOX Board do? VOX is a member-led organisation which means that VOX members decide the organisation’s values and priorities. They do this by attending the two national members meetings per year and by voting for VOX Board members at the September AGM… or maybe even by standing for election to the Board themselves. The VOX Board meets each month and consists of 12 member directors (VOX members voted onto the Board by other VOX members at the AGM) and 3 non-member Directors (with mental health expertise). The member directors ‘manage’ VOX business on a month by month basis – they act on members’ views, tell the staff what to do and make sure the organisation works within budget. VOX Directors are elected for six years at a time and they must stand down after six years for at least one year before they can think of joining the Board again. No-one has a ‘right’ to be a VOX director – all 12 member directors are ordinary VOX members with a lived experience of mental illness elected by fellow members. We do our best to be fully democratic! If you feel passionately about mental health and want to get your teeth into policy issues, please do think of becoming a VOX Director – we’re always looking for talented active people! What do the VOX staff do? Firstly, there are only 3 of them (3 part-time) and they have to cover the whole of Scotland – they can’t do everything but they do their best! VOX staff are basically ‘servants’ of the VOX members and Board. The members set the main priorities at the two national members meetings per year, the Board manages VOX on a month by month basis and VOX staff look after business on a day to day basis. The staff update the VOX Board on their work every month to ensure that their work reflects the priorities of the wider VOX membership. The VOX Directors and VOX staff are in regular contact to ensure everyone works to the same plan and this plan is decided by the members – VOX staff and VOX members work ‘in partnership’. Can VOX help its members with individual problems and concerns? 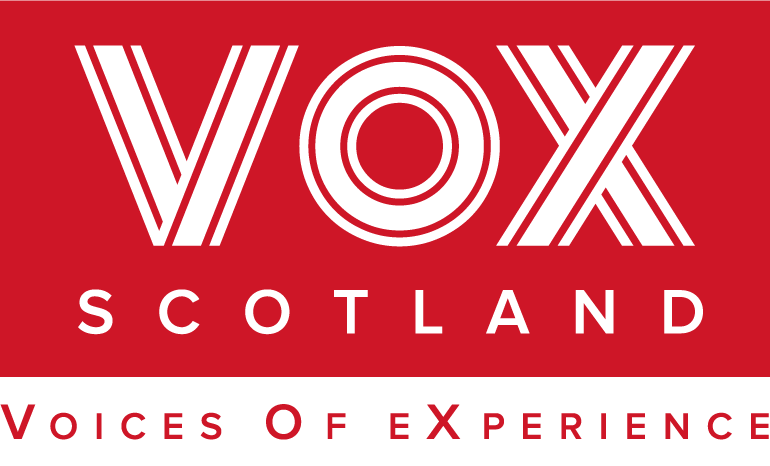 No – VOX was set up to represent its members’ views at the national level and to ensure that Scotland’s laws and mental health services reflect the views of people with a lived experience of mental illness. We don’t provide individual advocacy but if lots of individuals approach us with the same problem then we obviously try to take that forward. If you do have individual problems or concerns, please speak to your MP/MSP or local councillor. You can also contact your local advocacy organisation and its also worthwhile popping into your local Citizens’ Advice Bureau. Please visit our General Help and Advice section for lots of useful contacts and ideas. There isn’t one! VOX membership is free and no-one is forced to attend lots of boring meetings and committees. And if you do attend a VOX event (or attend another mental health event to represent VOX and its members), we’ll reimburse your travel/accommodation expenses so please keep your receipts. No-one ends up out of pocket by joining VOX. Remind me – why should I join VOX? 1. Be part of a bigger community – it’s good to know you’re not alone. 2. Get your point of view on mental health issues across to people in power. The more members we have, the more difficult it will be for them to ignore us. 3. You can attend two national members meetings per year but only if you want to – they have a fun side and a serious side. 4. We also organise one regional meeting per year to ensure the VOX message goes out to all parts of Scotland. We’re not just a ‘central belt’ organisation. 5. Members receive weekly email updates of local events and activities they can get involved in. 6. VOX provides training for people who want to get more involved in public life and events. Anyone wanting to set up a group representing the views of people with a lived experience of mental illness should contact the VOX office for support. 7. If a VOX member attends a mental health event to represent the views of VOX and its members, we will cover their travel and accommodation expenses (but please check with the office first that it’s an event VOX supports). 8. We undertake regular research on mental health issues for the Scottish government and other bodies and VOX members can participate by completing a survey or joining a focus group (but only if they want to!). 10. If you feel strongly about mental health issues, you can stand for election to the VOX Board and start making a difference. We’re always on the lookout for keen, enthusiastic members who can speak out in public. Contact the VOX office on 0141 572 1663 or info@voxscotland.org.uk to learn more about becoming a Director.